THE WALTHAM 8-DAY LEVER ESCAPEMENT CHRONOMETER has undergone and passed satisfactorily the rigid and exacting tests of the Naval Department of two of the principal maritime nations. We secure as great accuracy as is attainable over an eight-day run by means of two mainsprings of extra length, both operating in the train simultaneously. THE WALTHAM CHRONOMETER is adjusted to compensate over a wide variation in temperatuer; it is also adjusted to isochronism and put through the Polarity test. The movement is fitted with a Winding Indicator showing the number of days which have elapsed since last winding; and is enclosed in a dust and weatherproof case with screw back and bezel. The box in which the CHRONOMETER is suspended is of polished mahogany with brass trimmings. 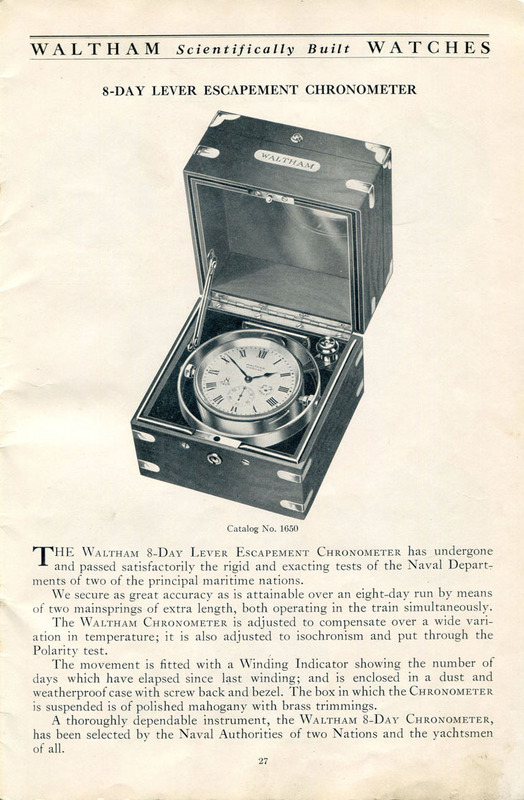 A thoroughly dependable instrument, the WALTHAM 8-DAY CHRONOMETER, has been selected by the Naval Authorities of two Nations and the yachtmen of all.